Members, Clubs & Special Helping Friends Of ROTARY INTERNATIONAL. This ROTARY INTERNATIONAL story began in 1996 when New Bern, NC Breakfast Rotary Club member and past District Governor Dale Reinhardt enlisted his club and Rotary International to build a library in Chacala. His friend Dale Elks and his son Mark carried his dreams to completion. Over the years, many volunteers have contributed their time, energy and cash to expand the library and bring educational opportunities to the children of Chacala. Today that Library is the Dale Reinhardt Learning Center. The Center honors Dale’s memory, contributions and faithful support. The Center has grown to embrace programs for children at all levels-from sports to handicrafts, from theater to summer school, from math tutoring to English lessons. Many wonderful people in these monumental first steps have faded into time. Here we remember many but sadly not all and yet we do so humbly thank them all! Their scholastic progeny multiply by the day! And their story evolves without end. A year after it’s inception in 1997, Rotarians Jim & Betty Thompson from Kalispell Montana visited the project and found that harsh climate and insufficient support had taken a serious toll. Undaunted, they personally set about to restore it, staff it and fund it for a short run before returning to secure more support from Kalispell and other Rotarians. Long time local expatriate Susana Connor and then partner, Poncie Escobedo, stepped in profoundly … expanding and running the after school program, recruiting an eventual super star, Viky Robelo (who remains the Learning Center Program Director to this day.) Susana herself, ever helpful in every Rotary International Chacala Project to come, is currently an active member of the La Peñita Rotary Club. She remains invaluable in every Rotary Project that follows. Her “find” of Viky was exceptional … Viky at once demonstrated an incalculable quality of natural born authority and the obvious passion to go the distance (see Cambiando Vidas Staff). The longevity of this vital project has been virtually vouchsafed by Art Thompson & Rita Fitzsimmons who faithfully channel funds annually from their Kalispell Club … often the sole source in preserving the library through financially hard periods. A faithful support spanning now more then 10 years. In 2001, Kalispell Rotarians Jim & Betty Thompson, Art Thompson and Rita Fitzsimmons returned; this time delivering funds to build a small multifunctional extension now called, “el quartito.” This addition houses the Head Start and Kindergarten after School Programs. Viki frequently brings volunteers here to teach little ones their numbers, colors, shapes, & letters and to use the interactive learning games on the many donated computers. As if the deeds and devotions of Rotary Clubs, their members and local friends were not already legend … and their numbers legion, Hurricane Kenna, in 2002, nearly destroyed the village … and turned the undamaged small library complex into devastated Chacala’s nerve center for recovery. Rotarians everywhere were richly rewarded as they witnessed their grateful scholarship students rise to the occasion… Leadership became pandemic. The distribution of aid, safe water & food, hard labor and coordination were the students first instinct. As if those many nameless and selfless Rotarians had established their own personal Chacala surrogate to step up when needed, “Putting others before self.” They saw their work genuinely take a life of its own … and make that big BIG difference. Later that 2002, Berkeley CA Rotarians showed up with dollars and countless hours to start a second floor for the Computer Lab with permanent Internet Access. Computers came in as if by magic… from random donors, sailboat cruisers, and of course more individual Rotarians. Rio Vista Rotarian Jack Krebs teamed with brother Jim Krebs and personally donated the funds to tile the new lab floor … a unique floor … come see! In February 2003, Berkeley Rotary President John Ferguson and Dr. Pate Thomson brought Susana Connor to California to consult their Club … and returned with dollars, time and over forty workers…. plus Andy Brown from the El Cerrito Rotary Club (with all his own tools). Like an old fashioned barn raising this work took weeks and engaged the whole town with muscle, music, laughter and camaraderie. The new Tool Lending Library still offers tools (many with the vague initials of El Cerrito Rotarian Andy Brown still etched discretely on the handles). Pate & John returned again one year later, in March, 2004 with 30 more selfless Rotarians this time bringing Architect Grier Graff. They repainted what was there, re-roofed the kindergarten, added necessary electricity, repaired the bathroom, tiled the exterior walks and stairways and began a simple kitchen adjacent to the library and across the courtyard. The Kalispell MT Club followed on their heels with appliances, utensils, and finishing touches to make this hot lunch program a reality for Primary & Secondary students. Oh … and a nice little job was created to run this vital cafeteria! Oh and also … during meal breaks … these people built a few picnic benches still in daily courtyard use. Note! Also faithful supporters for over 10 years now! Also that March, 2004 a group of Omaha Nebraska Rotarians led by Marina Chacala home owner Janell Weeks Tessari came along side a group of local parents and began restoring a dangerously old and crumbling Secondary School. Tons of cement was hauled off and restoration commenced. A local wedding between Tamara & Frank McSwain caught the fever … re-directed their considerable gifts of money into this project and commenced their married life on a foundation of service to children! Among the guests (of course), Rotarians from Colorado, and North Carolina. The new roof beat the rainy season just in time! But July 2004 saw the Library roof eaves fail. On cue, Pate Thomson of Berkeley, plus Art Thompson and Rita Fitzsimmons of Kalispell joined with Cambiando Vidas fundraisers and brought in the needed funds to restore and redesign the damaged roof. The following year, March 2005 now, the fabulous Berkeley Crew returned to further the progressive saga. This time they partnered with the Puerto Vallarta Rotary led by President Fernando Castro. Also that March, Janell and her Omaha Club returned this time bringing Rotarians from Shawnee Kansas. They worked again side by side with devoted town people and parents to lay brick, mix cement, plumb, wire & paint. New desks, dry erase blackboards, two computer stations, a teacher’s room and secure storage all added to the beauty and function of the “Telesecundaria” in Chacala. This achievement was dedicated in late March and attended by many of the teachers from the State of Nayarit who use it now from time to time for in-service training of their own. A month later in April, the Santa Crux Sunrise Club led by Jason Book & Chad Waters (then a Chacala resident) came to install the school’s first playground equipment at the Kindergarten. They leveled the area, built a retaining wall, put down a safety surface around the equipment and stepped back to see the glory of their work on every child’s face. The Summer School Session of 2005 offered a free English Class donated by Sally Weissinger of the Berkeley Club. Twenty people took the course! Jack Krebs got his Rio Vista Club to carry the baton by extending the free English class into 2006. And once again Janell Weeks Tessari brought her Omaha & Shawnee Club crews to build an addition to the Kindergarten. It’s really a joy to see those little kids come to their very first day of school … their very first classroom. In 2009, Mariana Day worked with Jack Krebs and his Rio Vista Rotary to install our English Language Center: This is a stand-alone computer station with Rosetta Stone software. Many of our CV scholars participated in the classes. Rio Vista Rotary has donated another $3,500.00 for building maintenance and scholarships. Jack Krebs never fails to keep these projects forefront in his Club’s budget. Also in 2009 the Lake Norman, North Carolina Rotary Club, lead by BK Barringer, in collaboration with Rotary International and Compostela Rotary funded the Learning Center computer lab upgrade. Over $18,000USD were donated to replace old computer equipment and furniture. It took over three years of work to over-come international funding cuts. BK consistently led the way for over two years, in times as tough as any could remember. The computer equipment was installed in 2009. The Chacala Rotary Medical Clinic was also the dream of Dale Reinhardt. He began to plan for the clinic ten years before his death. In his eighties, he drove from Oriental, North Carolina to Chacala, a grueling four days, every year, to work with Compostela Rotary. His son, Mark, would sometimes accompany him and carried on following his father’s death. Other Rotary Clubs joined in with private donations made by Janell Tessari, and Shawnee Rotary came for a one week work party. Good friend, Dale Elks also of Oriental Rotary collaborated with Rotary International to provide all the medical furniture and details. Viky Robelo, on top of her full-time Learning Center demands, was also the project manager of the Clinic. Kalispell Rotary sent Dr. Jack once again to help the town access the clinic to the needs of the community. Dr. Jack met government community service Dr. Leo, another great collaboration. The Clinic is currently in full operation and was Dedicated in August 2009. As we go to press this 2010, all is well across the educational and community service fronts. Rotary and others are forging ahead on the relocated Recycling Depot, and plans to fulfill the community playground and sports court are materializing. But as you have read this far you also know that obstacles, shortfalls and human fatigue will oppose the great works done and the great plans in progress. There will be new history to write, new champions to lead & follow in these noble causes, new hopes & dreams to inspire, and new accomplishments yet undreamed. They will happen because there are people who are able to put themselves aside for a time … a season or so … and quietly serve others. Perhaps the greatest pat on the back comes from ones own self upon reaching the dignity of secret service. For those champions whose names and deeds have painfully slipped from the public eye we hereby extend our highest gratitude. Yours is the greatest gift. A LITTLE RETROSPECT BEFORE MOVING FORWARD! These simple buildings are so much more than bricks and desks. They are collaborative labors of intense love for our priceless kids… monuments to the very best of human regard… fairy tale places where ordinary people achieve the extraordinary … together. Rotary members should take great pleasure in seeing the great selfless good they have done. Chacala is perhaps an epitome of ROTARIAN generosity of spirit. We here think so! A dream of one man can make a difference. His name was Dale Reinhardt. He believed that every child, no matter his station in life, deserved the right to learn to read. Dale’s dream was to build a small library in a small Mexican village called Chacala. Dale was a Rotarian. Dale shared his dream with his Oriental North Carolina Rotary Club. Tenacity and luck, working with Rotary International, saw the Biblioteca of Chacala become a reality. As with all progress, there was a problem. Turning Dale’s dream into a reality and creating the physical plant was step one. Step two meant that the community had to operate the library, embrace the idea of a community center. Ignorance won over reality. The library was closed because certain members of the community thought that the electricity bill was too high. Six months later, the termites were the only occupants of the library. A legacy made to a dying sister can made a difference. Susana Escobido promised her sister, Judy, that her love of children and the arts would not die, but live on. Driven my her promise, Susana found the library. She re-opened it and ran an after-school program. She encouraged the community to participate, women like Trini Moya and Viky Rodriquez. Ana Getzoff dropped in one day and was captivated. Ana was on her own breast cancer survivor journey which she wrote about in her book, Travels With Annie”. Mariana Day arrived and listened to Susana, Trini, Viky and Ana lament about the limited education opportunities in Chacala. (Please see the Cambiando Vidas story). There were other problems to solve, money to keep the doors open. A couple, Betty and Jim Thompson, from Kalispell, Montana visited one day. They carried the library story back to Kalispell and shared it with a good friend, Art Thomson, a Rotarian. On Art’s next trip to the Mexican coast, he investigated the small library and saw a perfect Rotary service beyond self opportunity. He returned and presented his findings to his Rotary club. The club donated money to help the library survive. The money was personally brought down by Rotarian Rita Fitzsimmons and her family. The two Kalispell Rotary Clubs have continued their support for the last ten years! Chacala is one of the most captivating bays in the world. Many cruisers know of Chacala. One cruiser couple, Dave and Linda Allen, told another cruiser, Pate Thomson, about the needs of the library. Pate is a Rotarian from Berkeley, California. Pate and his friend, John Fergenson, were looking for a three year project for their Berkeley Rotary club. Susana came to Berkeley to work help them work through the logistics. A library expansion project was born, including a second floor computer lab, a cafeteria and a tool lending library. Over the three years, they expanded out, projects for the primary school and the kindergarten. Berkeley Rotarians did not just bring money, they brought workers, sometimes twenty to thirty in one work project. They supported the town with their tourist dollars. They fell in love with the children and supported the scholarship program. The library became the Dale Reinhardt Learning Center. The name was announced at a North Carolina district meeting where Dale was attending. North Americans began making Chacala their second home. Some were Rotarians. They carried the education and Learning Center story back to their Rotary Clubs. Rotarian Jack Krebs from Rio Vista California, brother of Jim Krebs resident, help lead the way for his club’s donation of a tile floor to the Learning Center and later a English computer lab program. Omaha, Nebraska Rotarian, Janelle Weeks Tessari, resident, brought her club work party to re-model the secondary school two years in a row, from the foundation up! She has since moved to Houston where she has encouraged her new Rotary club to fund a scholarship. A visiting Rotarian from Shawnee, Kansas City , came to hear Janelle speak at her club and was hooked. 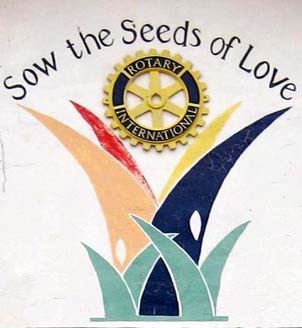 Shawnee Rotary has participated in work parties on the secondary school, the medical clinic and the kindergarten. Chad Water, former resident, was the link to Santa Cruz Rotary’s work party to build a play set for the kindergarteners. BK Berringer, from Lake Norman, North Carolina Rotary worked for three years to get a RI grant to re-place the aging computers in the Learning Center’s computer lab and succeeded. Lastly, Dale’s memory lives on. Before Dale passed away, he was successful in starting the physical plant for the Chacala Medical Clinic. Dale Elks of Oriental Rotary has led the challenge for completion, along with Dale’s son, Mark. Many other Rotary clubs have helped make Dale’s dream a reality. Rotary International is providing the equipment and the furniture. The clinic will now qualify for Mexican government program of free doctors, nurses and dentists. The clinic will be dedicated by the Mexican Federal Government, the community of Chacala and Rotarians from the U.S. and Mexico in August 2009. The Rotary story continues to evolve. The scholarship students started a recycling program six years ago. They consistently win national competitions. Their program is self-sustaining. The recycling center is an eye-sore and a hazard to work in. Rotary clubs Camas in Washington and Kalispell in Montana are donating seed money to build the Chacala Recycling Center. The project is in process. We know other Rotary clubs will help finish the project. The Rotary story in Chacala embodies the spirit of service beyond self hand in hand with education. students are continually lined up on our waiting list, some for more than a year. They pledge their willingness to participate faithfully with the CV Community Service Program, to work & study hard, attend all learning and project events, to share their strengths and seek assistance when they need help. Those who fail to devote themselves are carefully investigated and offered appropriate help. Those who persist in substandard effort are let go. Parents are required to develop as much equity in their student’s progress as they can. This means their supporting association, their own fund raisers, encouragement, in many cases relief from family business demands, and above all … equality and fairness among themselves. A student must begin CV in “Secondari” grades to qualify for support through High School and beyond.